WARSAW, Poland – A parish in western Poland will dedicate what it says is the world’s largest statue of Christ in what a local church spokesman said is a “show of devotion” by local Catholics. “We’re treating this monument as a sign of faith – an external manifestation that religious belief is still alive here,” said Father Andrzej Sapieha, spokesman for Poland’s Zielona Gora-Gorzow Diocese. “While we are called to live a Christian life, faith also demands material proofs through the figures and crosses adorning our churches. This statue very much reflects this logic,” he told Catholic News Service Nov. 8. The reinforced-concrete statue, more than 35 feet taller than the Christ the Redeemer statue in Rio de Janeiro and the Christ of Peace statue in Cochabamba, Bolivia, will be dedicated in late November at Divine Mercy Parish in Swiebodzin, 20 miles from the border with Germany. “The fact that the biggest Christ figure in the world is being set up here shows the strength of Polish belief and will encourage Catholics to have trust in Christ and renew their faith,” he added. 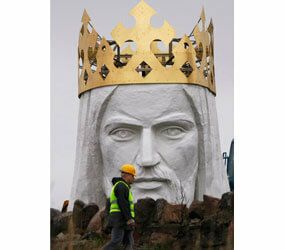 Poland’s Catholic information agency, KAI, said the head of the statue was 15 tons. It is situated on a mound and will be visible for at least 10 miles in each direction. It added that the 433-ton figure, topped by a 10-foot crown, had already attracted sightseers to the 22,000-inhabitant town. Monsignor Sylwester Zawadzki, the former pastor who commissioned the statue, said the figure, with its adjoining altar and stations of the cross and its proximity to the main highway, would “provide a catechesis for millions of people” passing the town. Father Sapieha told CNS the statue’s costs had not been disclosed by the parish, where a new twin-towered church and rectory were consecrated in November 2008.